So, yesterday I walk into work only to discover a note hanging on the wall about little 'ole me! 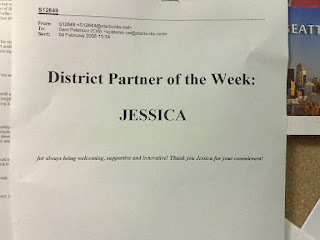 It said I was District Partner (employee) of the Week and I was chosen for this award for always being welcoming, supportive and innovative. I know you are asking yourselves, is this the same Jessica that we know? People, come on! You had to know I had it in me somewhere! I must admit, I am quite happy to receive this award. It has brought me back to my childhood when everyone receives awards; though they (they being parents, teachers) tell you that you are special for getting it. I still remember my mom creating a book with all my awards in it. It was great. I used to love looking at that book. I wonder what ever happened to that book. People, remember to keep trudging along and maybe one day you can get an award too! I am so proud of you. I knew you had it in you all of this time. Didn't you get employee of the week every week at the good ol WDO? We can hang your award next to Reghan's gymnastics award. Good job, I will mail you a gold star. Do you get a starbucks gift card for being partner of the week? Just so you know the book with all of your awards is upstairs on the shelf next to my desk. Make sure you save this award so I can add it to your book! We want to come visit. Kate and I were talking about it today, so you will have to educate us on the best time to come!